HomeNetworkingWhat Is Networking Field Day 5 Anyway? It’s almost time for Networking Field Day 5 – also known as NFD5. If you’re a regular reader, you’ll recall that I was lucky enough to be a delegate to Networking Field Day 4, back in October 2012. 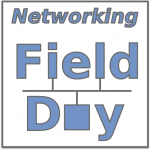 I am thrilled to say that I have been invited to return as a delegate to Networking Field Day 5, which is taking place at the start of March. Since I’ll undoubtedly be talking in the future about the event (or things I learned there) I thought it might help if I were to explain a little more about how a Field Day event works. Networking Field Day is one of a series of events organized by Gestalt IT – and more specifically by Stephen Foskett – that turn the normal conventions of vendor events on their head. Originally a more general Tech Field Day, the event has been so successful it has branched out to add more specialized Wireless Field Day, Storage Field Day, Network Field Day and Virtualization Field Day events in addition to the original. A normal tech event might be, for example, a tech conference – somebody organizes an event where vendors buy booth space or presentation slots, and they sell tickets to thousands of attendees who travel to the event in order to gain access to the information. That’s great so long as you have the money for travel, hotels and the entrance ticket. Field Day™ events work differently. Vendors (sponsors) pay to buy presentation slots at the event; there is only one presentation at a time – they aren’t competing for delegate attention. Presentation slots are organized over three days and delegates attend every single presentation. This alone differentiates Field Day from almost every other event; vendors get a guaranteed audience for their presentations. Another dramatic difference is that there are no ‘tickets’ – at least, not in the conventional sense. Delegates are hand chosen by the event organizers (read more) and are personally invited to attend (so more of a “Golden Ticket” event, which may make Stephen Foskett a kind of Willy Wonka character!). And here’s the kicker – delegates’ travel, accommodation and food costs are paid for by the event itself. This allows delegates to attend even if they (or their employer) could not or would not otherwise fund it. It also means that the sponsors of the event are effectively paying for the delegates to be there – although it should be made clear that it is only expenses that are covered; delegates receive no fee to attend. To that end, since it’s not really practical to invite thousands of people and pay for them to be there, the delegate list is small – usually around 12 people. It should also be made clear that there is no quid pro quo in this arrangement. Delegates are under no obligation to blog, tweet or otherwise communicate about the event or its sponsors. More to the point, delegates are allowed – and indeed encouraged – to give their honest opinions if they choose to talk about the sponsors and their products. It would be pointless to do otherwise, as any delegate that effectively acted as a shill for the sponsors would quickly lose credibility with their own audience, and their opinion would not be considered independent and impartial. To many of us who blog, retaining that impartiality and transparency is critical, and to that end you’ll note that all of my posts relating to Field Day sponsors have a clear disclosure statement on them explaining my relationship with the sponsor (or lack of relationship) as a result of the Field Day event. The event is open to anybody, worldwide. At Networking Field Day 4, if I recall correctly, there were delegates for example from the USA, England and Australia. If you’re interested in becoming a Field Day delegate, there’s a page explaining the process. Most critically, you need to be independent (see the guide for more information on what that really means), to be someone that contributes back to the community (a technical blog is a good example), and demonstrate knowledge in your field. In other words they’re looking for influencers who might want to share their opinion about what they saw. For the sponsors, this is a rather unique opportunity. They only get to talk to a small audience, but it’s a highly motivated audience. Experience shows that while there’s no obligation to talk about products, delegates certainly do – mainly because one or more presentations excite us and we want to share the information. I’ve certainly been guilty of that! For NFD5, the currently announced sponsors are Juniper, Plexxi, Solarwinds and “Secret Company” (more info on the use of “Secret Company” here), and I believe there will be further announcements too. At NFD4 last year the sponsors were Cisco Borderless, Juniper, Brocade, Opengear, Spirent and Statseeker. What amazed me at NFD4 was just how motivated the sponsors were to talk to us, and how open and accommodating they were. It’s clearly such a strong symbiotic relationship, and the value for both delegates and sponsors is clear. Technically speaking, the information flow at NFD is like a fire hose. This is no vacation in San Jose – the presentations go from morning to night, and outside those times (e.g. meals and travelling between locations) you’re in a group of Alpha Geeks, so conversation pretty much always returns to technology again. You’re “always on” for the entire duration, which is exhausting, but is an incredibly positive experience. The biggest difficulty is keeping focused throughout, but it’s worth the effort. Socially speaking, at NFD4 I met a group of fantastic people. Many of them I had been following on Twitter for a while, and others were new contacts, but without exception they are all people I would like to see again, and the collective knowledge of the other delegates was utterly intimidating. It’s really an honor to be a part of a group like that, even if I keep feeling like an impostor! Pete is a 15+ year CCIE who loves network design, and is currently avidly learning various datacenter technologies. Tom Hollingsworth, CCIE #29213, is a Senior Solutions Architect for a small VAR focusing primarily on K-12 education. For those who are not lucky enough to be delegates, don’t worry – you can still take part! Most presentations are streamed live in HD, so you can watch them as they happen. If you have questions, shout on Twitter, and the delegates try to pass some of those questions on to the presenters. Watch streams live on the NFD5 site or the Tech Field Day main page. After the event, the videos are processed and uploaded to a couple of sites – usually to Vimeo then YouTube, so you can catch up on them later too. Watch for hashtag #NFD5 and follow what’s going on. Use hashtag NFD5 if you want us to see your tweets and questions too. The fun starts on Wednesday March 6th. Please join us – there’s so much to learn! Please read my Disclosures page for more information. 1 Comment on What Is Networking Field Day 5 Anyway? NFD5 is gonna be a blast. I’m really looking forward to it.